Sleep is good for you. It lets your brain flush and reset itself. During sleep, your body performs routine maintenance, including cardiovascular support. Everyone needs sleep—it’s a myth that some people only need 4-6 hours (tests show they’re functioning well below average and shouldn’t even be driving! ), and that we need less sleep as we start to age. 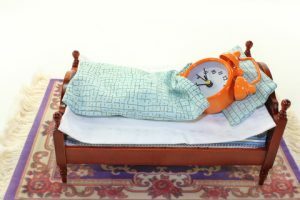 Once we’re past the developing and growing stage (sometime in our early twenties), everyone should be falling between seven and nine hours of sleep per night (depending on genetics). But what about people who sleep more? The first thing to rule out is sleep apnea. If you’re not breathing well while sleeping (which might be indicated by waking frequently, snoring, and still feeling tired in the morning), you’re not sleeping deep enough to get all that hard work the body does done at night. A sleep study (which can often be done at home these days) can confirm sleep apnea, and help you get fixed. People with sleep apnea are at an increased risk for heart attacks and stroke as early as their late 30s/early 40s! While sleeping with a breathing mask may be uncomfortable, the rule most offer is to stick it out for at least 6 months while working with a sleep specialist to help you get to the right style and support for your habits. If you rule out sleep apnea, the second thing to check is your heart health, and for the same reason. Sleep apnea means you aren’t getting enough oxygen, and the same is true if your heart isn’t pumping efficiently. A routine check-up where you mention your sleep problems (sleeping too long, too poorly, and still feeling fatigued) can get you started down the rabbit hole of heart health (which everyone needs to monitor anyway!). If you’re good on those two major health risks, then explore a simpler, easier to fix problem, like an infection. If you’re sleeping too long, it might be that your body is fighting an infection. You may not yet be experiencing flu-like symptoms or other problems (besides fatigue) during your waking hours, but you may have been exposed to some pathogen that requires your immune system to pick up the battle—and your body to need extra rest to rebuild and restore. Give your body extra support with colloidal silver. Colloidal silver supports the immune system, and may help your body get itself back to normal. Take it daily as an extra layer of support and defense, or take it as needed when you sense something is wrong. Finally, too much sleep might not be physical—it might be mental. Depression, stress, and anxiety can cause oversleeping. For mild cases, some specialists recommend a stronger alarm. But often, people need more help than that. Start with something simple, natural, and easy for you to control all on your own—D.S.A. MGRx. While getting a hold of mental support is valuable in and of itself, sleeping too much for no physical reason can weaken your cardiovascular system. Pair the herbal and nutritional support of D.S.A. MGRx with exercise as a first step to getting your sleeping habits back on track!